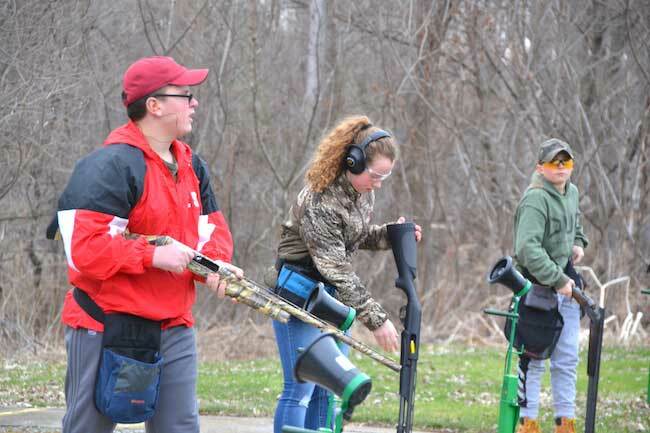 HOLLEY – Three members of Holley’s trap shooting team practice on Thursday evening at the Holley Rod & Gun Club. These three include, from left: Noah St. John, Leah Walker and Evan Press. 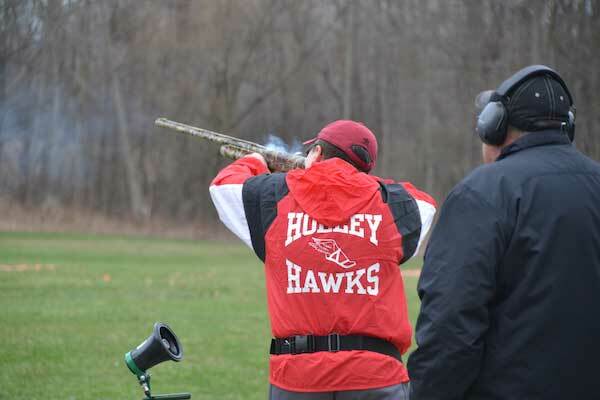 This is the fourth season Holley has a team competing in the NYS High School Clay Target League. Kendall started last year, and Albion has a team for the first time this spring. “This is the fastest growing sport in the state,” said Troy Kingdollar, an assistant coach for the Holley team. His daughter of one of the 20 members of the Holley team. State Assemblyman Steve Hawley, R-Batavia, met with the team on Thursday. Hawley said he is concerned about legislation in State Legislature that would remove rifle teams from state public schools. 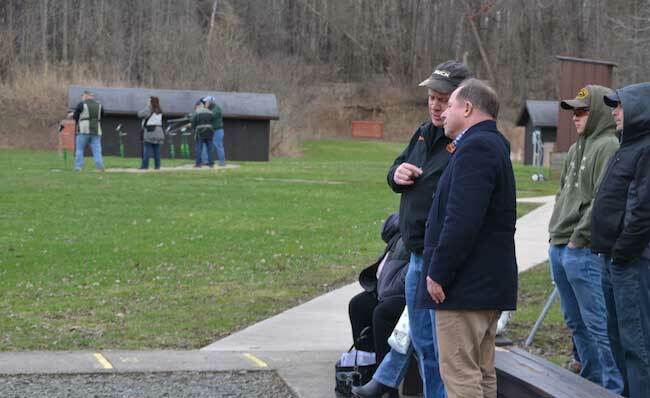 Hawley is shown speaking with Butch Moy, president of the Holley Rod & Gun Club. Assemblywoman Linda Ronsenthal, a Democrat from Manhattan, proposed legislation last year to not allow shooting sports at schools. That bill didn’t get through the State Legislature. But Hawley said the State Senate is no longer in Republican control, and isn’t a road block for legislation that would typically sail through the Democrat-dominated Assembly but then be stymied in the Senate. 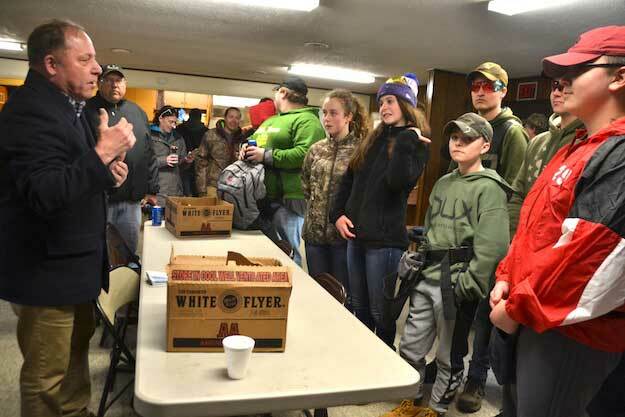 Hawley talked with Holley trap shooting members on Thursday, praising them for learning how to safely use guns and for participating in the sport. In New York City, many people and their representatives see guns as associated with crime. That perception is fueling anti-gun legislation, he said. “They are so afraid with having knowledge of the term, ‘gun,’” he said. He also worries about legislation is the Assembly that would ban gun raffles as fundraisers. Those raffles raise lots of money for fire departments and other nonprofit organization. Hawley said he plans to invite some of the Democratic Assembly members to his district, with a trap shooting team one of the stops. Hawley said building relationships with the downstate legislators is the best way to stave off legislation that he said is an attack on the culture of rural New York. “We’re going to work hard to make sure some of these whacky ideas don’t become law,” he told the team. Noah St. John fires at the target. John Waldon, right, is the team’s head coach. The competition for the spring season starts in about two weeks.